Queso fresco, simply meaning ‘fresh cheese’, is a favourite in Spain and many countries in Latin America. It is a light, moist, fresh, mild, creamy cheese that can complement everything from salad to savoury dishes. A light creamy fetta can be used as a substitute. Soaking the fetta in water for a short while will reduce the saltiness if you find it too much. This pairing suggestion, which unites sparkling rosé with water-melon and mint, should excite your taste buds with the unfamiliar combination of sensations. Watermelon is usually a tricky fruit to wine pair, but the versatility of sparkling rosé is more than a match. The combination of creamy, spicy cheese with the refreshing watermelon and mint, united with the fruity flavour of the sparkling rosé, is sensational. Use a blending stick or blender to mix the cheese, garlic, chilli, lemon juice, olive oil and mint (reserve some additional mint for serving). Process until smooth. 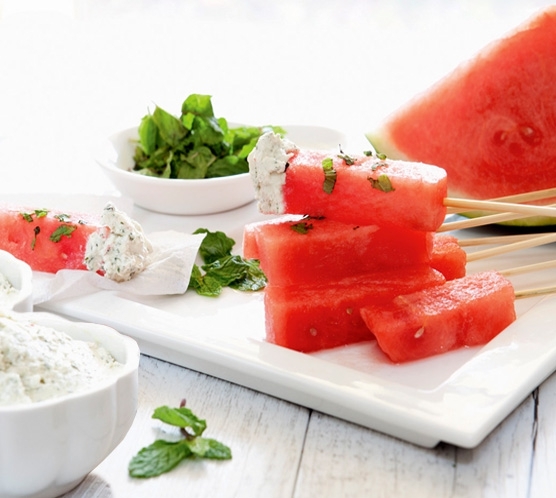 Serve with dipping sticks of chilled fresh watermelon sprinkled with finely chopped mint and a delicious glass of chilled dry sparkling rosé wine. Use a small spoon to smear the watermelon with the dip.